MagicTweak - tweak and optimize windows settings easily! SPECIAL PROMOTION! ONLY $29.95 FULL VERSION! To introduce our software, we are offering a special limited time offer for the full version! Click here to order now! The ability to tweak almost any aspect of Microsoft Windows XP/2000/Me/98. 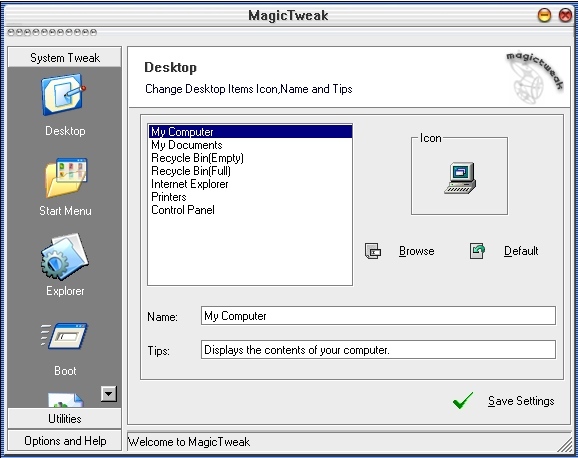 A user-friendly interface makes it easy for anyone to use MagicTweak. Optimize your internet connection speed. - Control startup items. Enable several hidden performance options of Windows. A more efficient way to uninstall programs. - Display a list of all running programs and allows you to force-quit frozen applications. - Clean up all the unwanted history data on your computer to protect your privacy. Plus much more! Try the free trial version first, or click here for pricing/to purchase a full version! Order by phone, fax, cheque, money order, or order securely online!